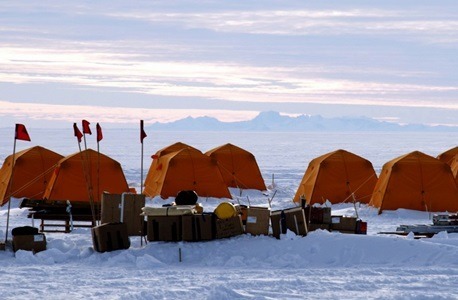 The 2013 WISSARD project camp in Antarctica. It’s a continent of extremes, boasting the driest, harshest, windiest and coldest spots on Earth. And for three NIU graduate students in geology who will spend time conducting research in Antarctica in January, it will be the opportunity of a lifetime—and an experience like no other. Because it’s summertime in the Antarctic, the sun won’t set on the endless and austere white landscape. 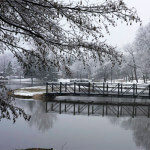 And the cold should be tolerable—with temperatures occasionally reaching 30 degrees Fahrenheit or even slightly above. Still, it’s an environment not for the faint of heart. When in the “deep field,” the young scientists will sleep in tents atop ice nearly a half mile thick, like camping on another planet. “This is my research dream, so it’s a pretty big deal for me,” says 25-year-old Rebecca Puttkammer of Sugar Grove, who has never before traveled overseas. 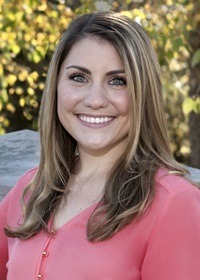 Puttkammer earned her bachelor’s degree at Northwestern University. While there, she took some geology classes and realized science was her calling. She came to NIU for graduate school to study with geology Professors Ross Powell and Reed Scherer, both veterans of Antarctic science and leading participants in the coming expedition. 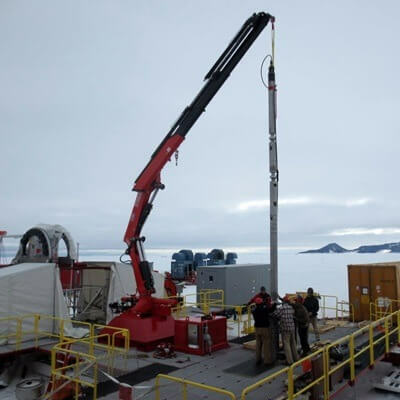 The National Science Foundation is supporting the drilling effort, part of a multi-year project known as WISSARD, for Whillans Ice Stream Subglacial Access Research Drilling. 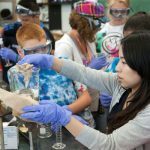 The research involves scientists and students from about a dozen universities – with NIU, Montana State University and the University of California Santa Cruz serving as lead institutions. Powell is the project’s chief scientist. The team intends to drill through the thick ice and examine the hidden shoreline beneath, where the massive West Antarctic Ice Sheet atop land meets the Ross Sea. It will be the first scientific exploration of the ice sheet’s “grounding zone,” considered an important piece of the puzzle for scientists working to predict the effect of climate change on rising seawaters, which threaten coastal cities worldwide. “It’s an exceptional opportunity for students, who get to travel internationally and work with a wide spectrum of top scientists,” Powell says. “They learn how to collaborate on a large scientific team, and how the information they help gather can be linked to different disciplines. It helps them mature significantly in terms of their careers. The 2013 WISSARD Drilling operation. Data collected during the expedition will likely result in numerous scientific publications, including students’ theses and dissertations. Jason Coenen, a 25-year-old graduate student who came to NIU to study with Professor Scherer, says he’s primed for the adventure and unconcerned about sleeping on the ice. While earning his undergraduate degree at the University of Wisconsin Oshkosh, he supported himself by working for UPS, unloading semi-trailers in the middle of the night, the temperature sometimes reaching -40 degrees Fahrenheit. “The cold is not a super big factor for me, and I don’t mind sleeping in a tent,” Coenen says. Jason Coenen tries on a set of Antarctic gear outside Davis Hall. Coenen will work with Scherer deciphering the geologic history and ongoing changes in the ice sheets by studying fossils known as diatoms, collected by coring into the seafloor. These microscopic single-celled algae live in shallow seawater and are deposited on the ocean floor, leaving behind beautifully ornate glass-like shells. Because different types of diatoms correlate with different water temperatures, they can reveal a detailed tale of climate change over time. Geologists need to understand the past to predict the future. Most of the members of the NIU team depart will depart Dec. 26, for New Zealand. After being issued their Antarctic gear, they’ll travel by cargo plane to McMurdo Station in the Antarctic, where hundreds of scientists from across the world make their base during the austral summer. 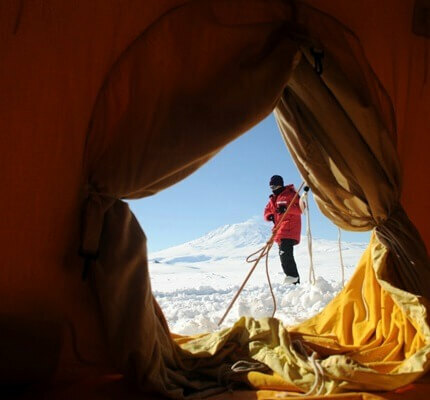 At McMurdo, they will undergo survival training, known as Happy Camper School. Built atop bare volcanic rock, McMurdo visitors also typically do some hiking and sightseeing near the station, which resembles a bustling old mining town, complete with several taverns. Common wildlife in the area include Emperor and Adelie penguins, Weddell seals and the ubiquitous skua, a seagull-like scavenger bird. By mid-January, most of the team will have departed by plane for the drilling site in the Antarctic wilderness, a frozen and literal desert painted in hues of white and silver. 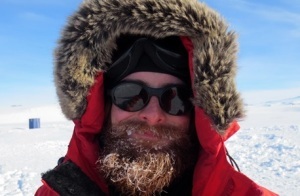 Hodson was part of the 2012-13 WISSARD expedition, which discovered abundant and viable microbial life in subglacial Lake Whillans, a body of water trapped beneath the ice sheet. 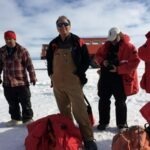 This season the scientists have moved downstream to investigate what is believed to be an integrated subglacial hydrological system connecting the lake to the sea. Hodson will use data from the two seasons for his dissertation, examining the geologic processes at the bed of the ice sheet and the behavior of ice streams as they flow to the ocean. These streams of ice can move at a rate of thousands of feet per year. A view from inside a tent on the ice. Having spent four months working in Antarctica during the first season, Hodson knows what to expect. This season, the 29-year-old Hodson is packing extra long johns—he will spend nearly a month in the deep field. He and an engineer will travel ahead of most of the team to set up scientific instrumentation and heavy equipment at the drill site. Contractors who work with the scientific team keep safety a priority. Once the site is set up, personnel from McMurdo will arrive to cook for the scientists. Because the window of time is brief for actual collection of data from beneath the ice, the work is nonstop. More information on NIU’s role in the WISSARD project is available here. Next story Speak Your Mind: Should Illinois Increase Minimum Wage?